The most common application for Variable Conductance Heat Pipes (VCHPs) is to maintain the temperature of the electronics being cooled as power and sink conditions change. A typical Variable Conductance Heat Pipe (VCHP), shown in Figure 1 below, has an evaporator, a single condenser, and an electrically heated reservoir at the end of the condenser. This system is commonly used in spacecraft thermal control to provide ±1-2°C temperature control over widely varying powers and sink temperatures. 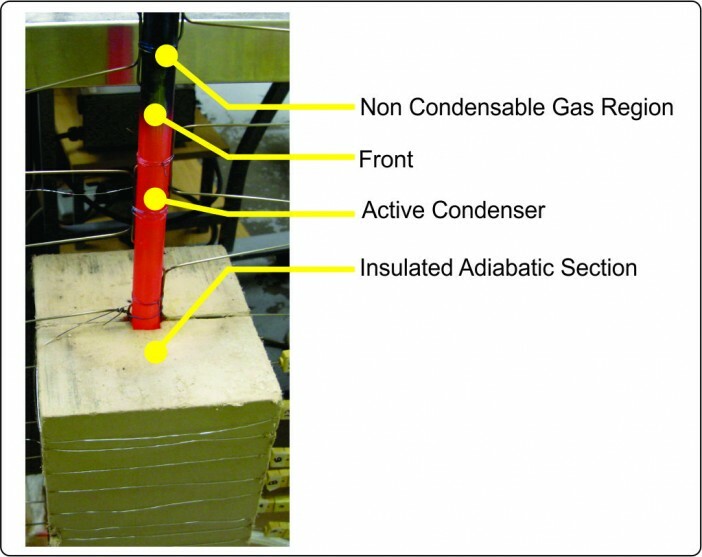 In a VCHP, a Non-Condensable Gas (NCG) is added to the heat pipe, in addition to the working fluid. When the VCHP is operating, the NCG is swept toward the condenser end of the heat pipe by the flow of the working fluid vapor. The NCG then blocks the working fluid from reaching a portion of the condenser. The VCHP works by varying the amount of condenser available to the working fluid. As the evaporator temperature increases, the vapor temperature (and pressure) rises, the NCG compresses ( Figure 2 top) and more condenser is exposed to the working fluid. This increases the conductivity of the heat pipe and drives the temperature of the evaporator down. Conversely, if the evaporator cools, the vapor pressure drops and the NCG expands ( Figure 2 bottom). This reduces the amount of available condenser, decreases the heat pipe conductivity, and helps maintain the evaporator temperature. 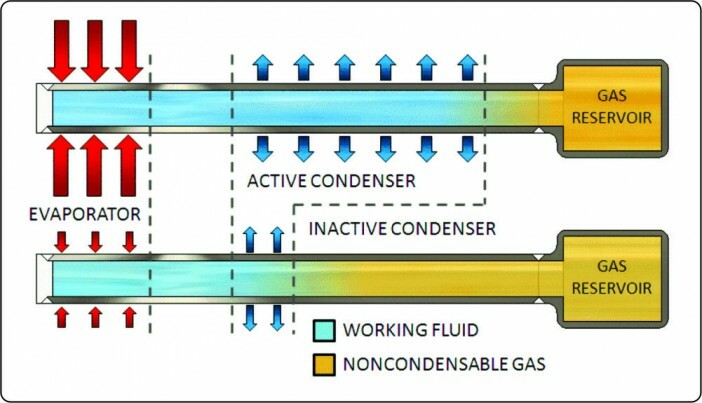 Figure 2 At high powers, the non-condensable gas is driven by the vapor flow into the gas reservoir. As the temperature drops slightly, the saturation pressure drops more rapidly, and the non-condensable gas starts to block the condenser. The working fluid/gas front is typically very sharp, as shown the VCHP with sodium working fluid, shown in Figure 3. The active portion of the heat pipe is around 700ºC, which is the orange region (it is orange due to the thermal radiation from the pipe at that temperature). The NCG is located in the heat pipe above the active region. Due to the low thermal conductivity of the gas, this section of the heat pipe is dark. Figure 3 Sodium VCHP showing the Non-Condensable Gas Front. 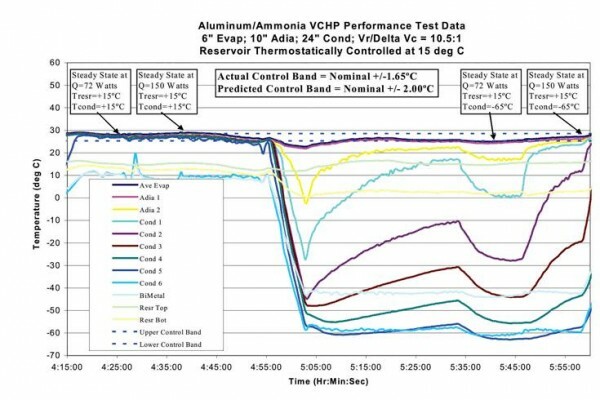 The graph below (Figure 4) shows the thermal performance of a reservoir-temperature-controlled VCHP that ACT built and tested for a spacecraft application. The evaporator section of the VCHP was controlled to +/-1.65°C as the input power was varied from 72 Watts to 150 Watts and as the sink temperature ranged from +15°C to -65°C. The control band achieved was in good agreement with the analytical prediction of +/-2°C.